There’s a very cool website out there called iSideWith that shows you, based on the issues that are most important to you, which of the Presidential candidates that you align with most closely. When I took the quiz, I most closely aligned with Gary Johnson (seeing eye to eye with him 95% of the time), followed closely by Ron Paul (92%). Anyways, on to my point. According to the data from iSideWith, if people voted based on the issues, Gary Johnson handily beats any other candidate out there. Barack Obama, as the incumbent, wins a total of 217 electoral votes in 16 states. He wins the states you’d expect him to win – the west coast, north east and a few in the great lakes region. Jill Stein (Green Party) beats out Obama in Vermont and Hawaii which are two of the most left leaning states and wins a total of 7 electoral votes. Mitt Romney only wins 4 states – Utah, Alaska, South Dakota, and Alabama – and receives 21 votes. Virgil Goode’s (Constitution Party) best showing was 3rd place in South Dakota, but generally placed in the back of the pack taking sixth in 43 states. 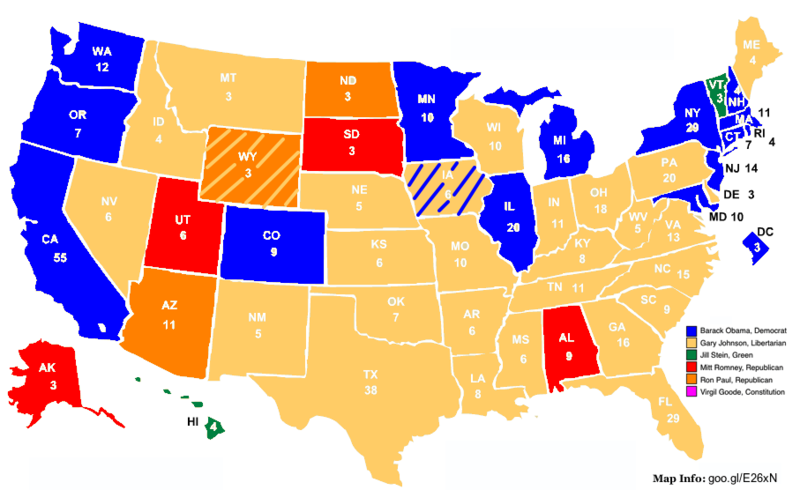 Ron Paul wins 3 states – Arizona, Wyoming, and North Dakota, but racked up the most second place finishes with 27. Paul received 17 electoral votes. America, it is time to stop voting for the “lesser of two evils.” And no matter what anyone tells you, no vote is a “wasted” vote. If you vote your conscious, nobody can fault you for that.